Sakyil Tseta was born in Rebkong, Amdo. 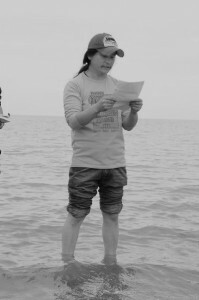 He started writing in 1998 and published his first piece in the Rongwo Monastery magazine called “The Golden Bridge.” Since then, he has been published in many literary magazines. In 2002, he published his first book of essays titled “The Soul of the Dove”. Along with Jashung Yangba and Wari, Sakyil Tseta is a well-known essayist in Tibet. These days a spring wind is rising under the clouded sky. In these days when a spring wind is rising, the villagers with bothered and humble eyes complain about someone, curse someone. At the intersection of the city and the street where there are no red mirrors searching with their eyes for the caged birds, the villagers push down their tears of suffering and wish to spit on someone with their lament. In every village of Rebkong, arrow bearing hunters multiply, on every street of Rebkong, red traps and black mirrors increase exponentially. The village people, their heads bowed down, are apprehensive of taking a breath. These days if you don’t take care, there are no dharma protectors who can save you. In these days when the people of Rebkong stay silently in their homes, where are the deities and dharma protectors that the people have placed in their hearts since the time of their ancestors? Are they disappointed that we can’t take refuge in them? Are they hungry because we can’t make incense offerings? Is this their answer? Ah, my deities and dharma protectors. Ah. And count stars through the window at night. In these days, in these days when a spring wind is rising under the clouded sky, shoots from the inner depths of the earth give vitality and confidence to someone’s young sun of hope. Now, once more the gorgeous peach blossoms bring to the people’s minds a certain compassionate and youthful face–that face from far far away is brought to mind, is brought to mind. I long for Shambala where the villagers have scattered their hopes.